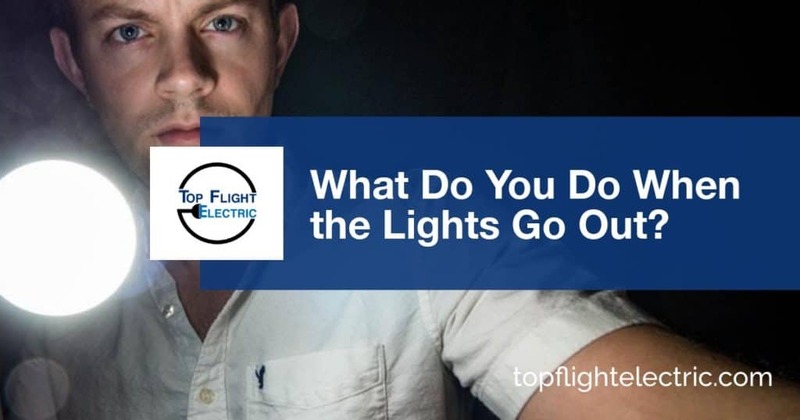 What exactly do you do when the lights go out? If you are like most homeowners, you grab your trusty flashlight with dead batteries, replace the batteries and head to the breaker or fuse panel. It is at about this time you realize it is late at night and are now in need of a trustworthy after-hours electrician. Calling a 24/7 electrician is something most homeowners dread. At Top Flight Electric, we take the anxiety out of needing electrician emergency service by offering you qualified, fair and honest home electrical services. Home electrical issues are serious and account for a significant number of fires and injuries. An after-hours electrician can respond quickly to keep you and your family safe. Is the affected area one room or entire house? If the power loss is limited to a single circuit, check the distribution panel for blown fuses or tripped breaker(s). Replacing a fuse or resetting a breaker once is fine if you are comfortable doing so, but, if it trips again it’s time to call a certified electrician emergency service. An after-hours electrician can test and repair the circuit for dangerous over current conditions preventing fire or equipment damage. If the condition affects the entire house, check the main distribution fuse or breaker if you are comfortable doing so. If this fuse or breaker is tripped, the entire home electrical outage is likely serious and an electrician emergency service should be called immediately. Top Flight’s electrician 24-hour services can dispatch an after-hours electrician to investigate and solve your home electrical problem. Breakers and fuses can trip due to age, poor construction or physical shock, but most likely it is due to over current. Over current can be caused by a variety of situations and if the source cannot be quickly identified, it is time to call an after-hours electrician for help. Safety first! Top Flight Electric provides electrician emergency service in Lakeland, Winter Haven and throughout Polk County. We know calling an electrician after hours can be stressful. Our 24/7 electrician will arrive with proper identification and work to solve your home electrical emergency quickly and safely. Our electrician emergency service always comes with our white glove guarantee – we leave your home as clean as when we arrive!